Inspired by an old BROKEN watch I found in a junk shop, no glass, no hands, no winder, and only half a leather strap, but a really nice, and unusual face layout. Ive never seen a watch like it, so decided to build a face, based loosely upon the junk shop find. Unfortunately, I didnt have my phone with me at the time of the find, so i drew it on a scrap of paper. I then proceeded to lose the paper by the time I got home. so this watch is basically from memory. Analog time and separate seconds dial, with rapid tick animation. 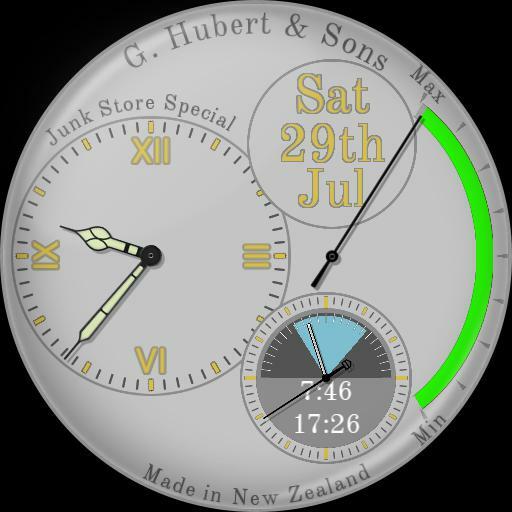 Ive added watch and phone battery displays, and date display window. Watch battery is shown by the needle on the right. phone battery is the colour changing bar , also on the right, that reduces as the percentage decreases, changing colour from green, through yellow and orange, to red. tap actions on time dial to switch from analog to digital and back. Tap date to switch to weather, and tap again to revert to date. In the seconds dial, which also shows a Sun dial, with dynamically moving daylight arc and an indicator showing the position of the sun on its progress through the day, not its position in the sky you will find a tap action to reveal the moonphase indicator, tap again to hide it again. All hands were found on Watchawear.com, but I have had them stored on my tablet for ages, so cannot remember who created them, sorry. Ive used just the basic, built in dim function. upon dimming all tap actions are suspended, and the seconds hand is removed, being replaced with a moon phase indicator.